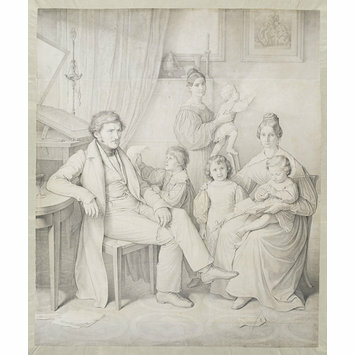 This portrait shows Swiss engraver Samuel Amsler (1791-1849) and his family in their home. Amsler’s engraving tools can be seen in the background and his engraving of Raphael’s Holy Family with Saints Elizabeth and John hangs on the wall. The comfortable middle-class interior is characteristic of the so-called Biedermeier style of the early 19th century. Drawing depicting the Swiss engraver Samuel Amsler, seated with his arm resting on a table. He is surrounded by his family, including four young children. On the wall in the background is an example of Amsler's reproductive engraving (made in 1836) of Raphael's 'Holy Family with Saints Elizabeth and John' (also known as the Canigiani Holy Family- see museum number 21474 for an impression of the same work). This portrait is a striking example of drawing from the Biedermeier period; an era roughly from 1815 to 1848 when middle class sensibilities and taste notably influenced the development of art and culture in Germany and central Europe. The sitter is the Swiss engraver Samuel Amsler. From 1829 he was professor of engraving in the Munich academy. Amsler was not a Nazarene but was closely associated with the movement, particularly with the artists Peter von Cornelius and Johann Friedrich Overbeck. The Nazarenes were a group of early 19th century German and Austrian painters based in Rome, where Amsler also lived between 1816 and 1820. Artistic life at this time was dominated by expatriate Germans in the city and Amsler's arrival coincided with the period when the Nazarenes were beginning to be accorded widespread public recognition. At this time, Raphael was widely regarded as the greatest artist in history. Hanging on the wall at the right of this family portrait is an impression of Amsler's own reproductive engraving of Raphael's Holy Family with Saints Elizabeth and John; the so-called 'Canigiani Holy Family', an impression of which is held by the V&A (museum number 21474). This painting had been the first original work by Raphael in Germany and in the late 18th century was moved to Munich, where it was as celebrated as the Rapael Cartoons were in England. Amsler's print is dated 1836, the same year that the Bavarian royal collection was redisplayed at the newly-built Alte Pinakothek, giving the painting even greater celebrity. In this drawing, Amsler is shown with what he evidently considered his most significant engraving, while on the left of the scene, his engraving tools are promidnetly visible. The pyramidal composition of the Amsler family group is doubtless intended to echo that of Raphael's Holy Family, towards which the youngest child reaches out. 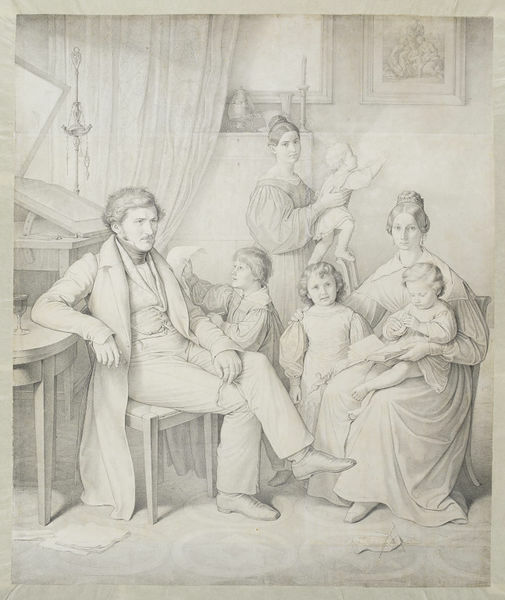 Drawing, 'Samuel Amsler (1791-1849) and Family'; by Wilhelm von Kaulbach; Graphite on paper; German School, c.1840s. Dr Mark Evans. (2016). "Full of truth and simply arranged": Wilhelm von Kaulbach's Portrait of Samuel Amsler. Master Drawings. LIV (1), pp.67-80. This portrait shows Swiss engraver Samuel Amsler and his family in their home. Amsler’s engraving tools can be seen in the background and his engraving of Raphael’s Holy Family with Saints Elizabeth and John hangs on the wall. The comfortable middle-class interior is characteristic of the so-called Biedermeier style of the early 19th century.